Some pictures taken by a family who loves our Hammock rain fly and ultra backpacking tent. They set it up last weekend at two rivers park where the Columbia River and the Snake River meet. The water and park look great. 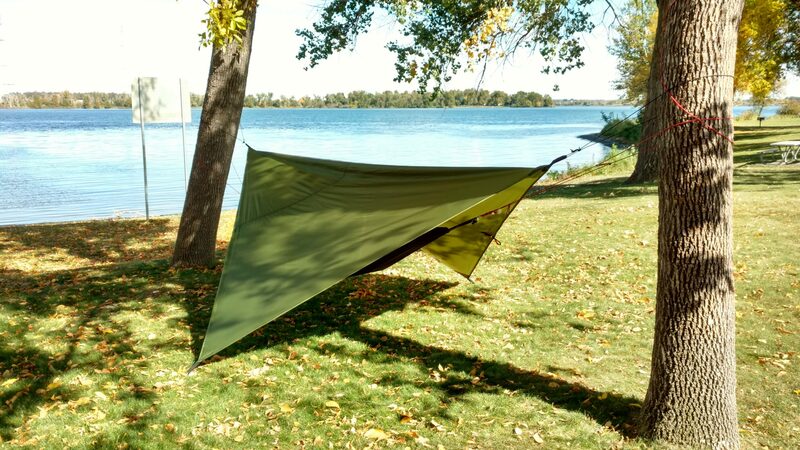 These pictures are awesome because they show three of the 100 possible uses of the Trekker Shelter Tent 2. they show it as an emergency shelter, a tent over a hammock, and a hammock rain fly. I love the way they set up the tent over the hammock, it looks like it would provide quite a bit of protection from the wind and rain and keep you warmer even in a Hammock. I’m going to the Catskill Mountains in March 2018, so I’m looking forward to using both for the first time. A very decent high quality crafted tent. Totally adequate space for two adults. Single walled, and that means light weight . It’s simple to set up. A tent that is great for all weather and seasons. I communicated with the maker of this tent. An artist, craftsman, designer, and a naturalist. A company that really does stand behind the quality and design of this product. Can we say bohemian? Yes we can. Nothing like laying in an awesome tent listening to the sound of whippoorwills waking you up with the sun rise, and letting you know when it is sun set. In a thunder storm, or sleeping by a gurgling brook. This is the tent for you. Bought this tent in eBay.